When do we declare a nation dead on arrival? Aside from being conquered by a foreign power, does a nation die when it is broke? Does a nation come to an end during a time of revolution? When one traces the demise of America, it appears that a nation dies when it loses its common sense. America’s closest ally, Common Sense, is in grave danger. 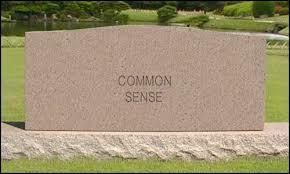 Recent reports indicate that our best friend, Common Sense has come down with a terminal case of globalism and is presently on life support while lingering in a profound coma. For nearly two centuries, Common Sense successfully guided our country. Nobody knows for sure when Common Sense slipped into a coma, but the safe bet is that following a series of catastrophic decisions, Common Sense is now on death’s doorstep. When did the patient take a turn for the worse? Was it when our country adopted the free trade agreements which forced manufacturing and its jobs to foreign markets? Was it when John F. Kennedy was murdered and the globalists completely took over the presidency? Was it when Common Sense lost his mind and provided free health care for illegal aliens while charging citizens and arm and a leg? Was it when we allowed our Congress to insider-trade on Wall Street with impunity? Was it when the globalists were permitted to begin to use electronic voting machines in order to make it harder to detect voter fraud? Was it when corporations were allowed to lobby and bribe Congress? Was it when the NDAA was passed and every citizen became vulnerable to government kidnapping and murder? Was it when we allowed unmarked planes to spray us with chemicals? Was it when Monsanto force fed us unlabeled GMO’s? Was it when we fought endless wars of occupation which hastened the bankrupting of the country? Was it when we let the banks steal our mortgages by selling our notes dozens of times over through the MERS mortgage fraud? Was it when we bailed out the bankers who destroyed our nation’s economy through their participation in illegal Ponzi schemes? Or, did Common Sense slip into a coma the day we re-elected a foreign born communist to be our President after a disastrous first term? During the course of its lifespan, Common Sense espoused and exhibited many virtues. Below, is a small representation of the wisdom once imparted by Common Sense. If it is not in the Constitution, do not do it. Government cannot spend more money than it has in gold to back up the paper money. Teachers know what is best for their students, not a faceless bureaucrat in Washington D.C. or at the United Nations. Central Banking is a very, very bad idea not to mention that they are profoundly unconstitutional. Executive Orders are a very, very bad idea and unconstitutional. Any foreigner let into the country should pass a test on the Constitution, demonstrate English proficiency and swear an oath to protect and defend the Constitution prior to being given citizenship. Common Sense got into trouble when it allowed this criminal government to pass Obamacare against the will of the people and the people did not even put up a fight. Common Sense lost ground when parents allowed teachers and television to replace them as the main disciplinarian in the lives of their children. His health further declined even further when schools were required to get parental consent to administer Tylenol or give an inhaler to a student. However, these same schools were not allowed to inform parents when a student became pregnant and wanted to have an abortion, or if the school wanted to administer psychotropic medication without notifying the parent. Common Sense went into a profound state of shock when it was discovered that many of the clergy became coerced into joining the Department of Homeland Security’s Clergy Response Team as pastors, priests and rabbi’s are paid to spy on the members of their respective congregations. Common Sense took a beating when the government declared that you couldn’t defend yourself from a burglar in your own home and the burglar could sue you for assault. Common Sense‘s health further deteriorated, after an Albuquerque woman failed to realize that a hot, steaming cup of coffee could produce a painful response if the woman carried the coffee in her lap as she drove. The woman spilled the coffee and was awarded a huge settlement. Common Sense appears to have given up on life when the government begin the first steps toward seizing the guns from its citizens as it left the country vulnerable to the growing number of despots ruling over us.